Don’t feel guilty about the occasional piece of cake or bag of chips. Save yourself the mental anguish and skip the kale – only 20% of the time. Four years of college can do a lot of things to your body. Those late night pancake runs, alcohol binges, and daily trips to the campus soft-serve machine can really fill out your jeans at an alarming rate. But gaining and losing weight through your last years of school can do harm to your mental health, not just your physical health. It can affect more than just your relationship with food. I have always indulged in sugary things, but that indulgence was never an obstacle I needed to overcome. Sometimes I struggle to restrain myself from eating a tiny treat after every meal. I run to anything filled with chocolate — a slow, joyous run through fields of sugar flowers and pools of marshmallow cream. Strangely enough, when I got to college, money was what kept me from gaining the dreaded Freshman Fifteen — or Fifty. I did not enter college having previously held a job, therefore I had little to pad my wallet with even less to spend on ice cream every night at the campus C-store. I ate my campus-provided three-meals-a-day without habitual snacking and dropped about ten pounds after my first year. I was well on my way to being not just healthy, but fit. Those changes, however, did something to my brain as well as my body. I had never struggled with the fact that I had a little extra pudge around me until I lost weight. Having to shop for new jeans and smaller shirts caused me to look at my body in a new way. When I went through old pictures of myself, I was startled at how big I looked. I didn’t stare at myself in a mirror for hours — thankfully I just wasn’t that preoccupied with my weight. If I could fit into my jeans, and they felt a little loose at the end of the day, I was happy. Don’t panic if or when your body changes due to diet changes. But when I lost weight and I thought to myself, “You look so much better,” those thoughts and feelings fueled a sort of paranoia that I would return to that previous weight, image, and would never look as good as I did then. My body image became the sole focus of my mind. Anxiety permeated nearly everything I said and did. All of a sudden every reflective surface became a mirror in which I primped and adjusted myself to look as skinny as possible. Oddly enough, my diet changed for the worse. After my sophomore year (a year in which I maintained the previous year’s weight loss), I decided not to buy a campus meal plan and started “cooking” my own food. My meals comprised of sandwiches, Pop Tarts, apples, and macaroni. When I started to feel my body growing, I was wracked with guilt, shame, frustration, and I even considered eating disorders. I was too lazy to make changes to my diet, but I was consumed with the thought of, “What have you done to your body; it was so pretty before.” After I ate anything remotely unhealthy, which seemed to be often, I would feel terrible afterward. Not because I wasn’t providing proper nutrition for my body, but that I knew I would gain weight. Health wasn’t my priority, my looks were. When I had lost all that weight freshman year, exercise was a non-factor. I occasionally played volleyball with my roommate on the weekends, but I hated running and ignored the gym in favor of studying. Two years later, when I was constantly pinching the flabby parts of my body, I finally started exercising. Thank God for Jillian Michaels. As I got stronger and more confident in my body, I started legitimately cooking for myself and buying more produce. 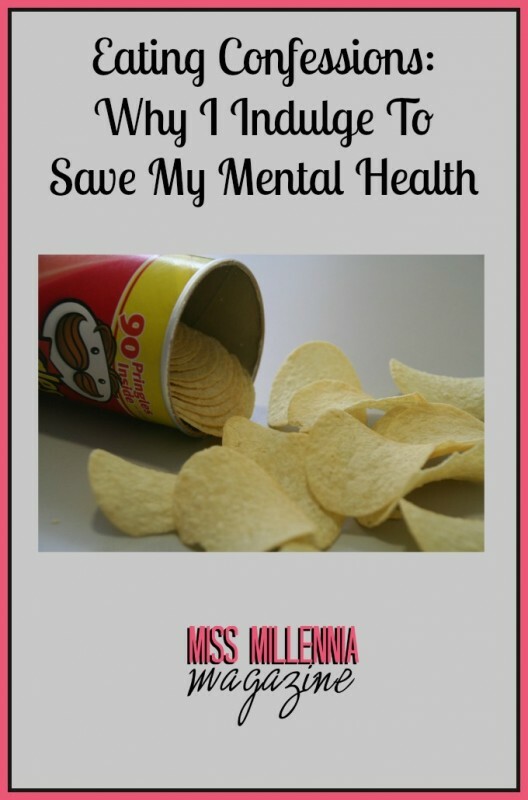 My mental health had suffered as a result of my anxiety. There was a constant battle in my head between craving sugar and craving a better body. Now, I have the conscience to treat myself when I’m craving it, but on the understanding that it is a singular indulgence, not a binge-fest. Health experts have recently lauded the 80-20 rule; choose healthy options 80% of the time, and reserve those sugary or salty treasures for only 20% of the time. Restricting yourself to all health food all of the time puts you in danger of falling off the wagon and diving headfirst into a box of Krispy Kremes, with no end in sight. Do yourself a favor and relax when you’re tempted to indulge. It’ll keep you on a healthy track and help you avoid potential damage to your sanity. Previous Post: « Why a Woman Shouldn’t Worry About Her "Number"